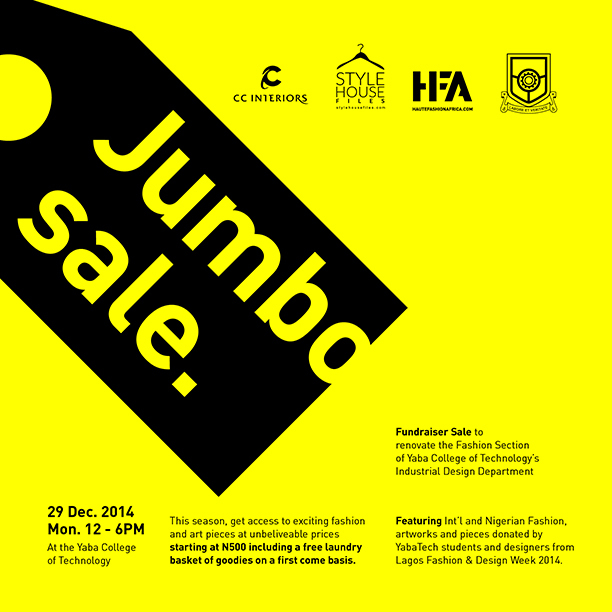 In the spirit of giving, as Yaba College of Technology’s Fashion Design Section celebrates its 50th Anniversary… its space, professors and their knowledge, Style House Files & www.HauTeFashionAfrica.com in Collaboration with Interior Designers Association of Nigerian (IDAN) Member – CC Interiors (www.CCInteriorsLimited.com) are hosting a fundraiser Sale with items selling as low as N500…featuring international & Nigeria Fashion, Artworks and pieces donated by students of the Yaba College of Technology, Amazing Friends and Supporters, Designers from Lagos Fashion & Design Week 2014, Garment Care & the Stylist Closet of www.theStyleHQ.com to name a few. Come out and give back in style by shopping brands such as Burberry….to Zizi Cardow in great condition and unbelievable prices! CCI and her passion for education will be helping to renovate and create a more conducive learning environment for the students. – Clothing, Accessories and Art Donations: lightly used and new to sell at the JUMBO SALE happening on Monday, 29th of December at YabaTech – 100% of the proceeds will be going to the funds being used to renovate. Please email: info@ccinteriorslimited.com for more information.